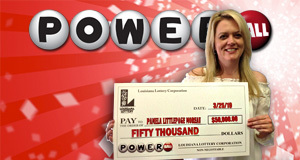 Congratulations to Pamela Moreau on her $50,000 Powerball win! "I was shocked to see that I won!" Pamela told Lottery staff. "I felt blessed and a great joy, then called my youngest son to check my numbers too, so I knew it was the real deal!" The Ville Platte resident purchased her big-winning ticket at Murphy USA #7191 on East LaSalle and plans to use her new dough to pay off debt.